I'm always looking for a decent case study that blends product innovation with marketing, brand, design and customer experience. Here's a decent one. Method—"for people against dirty". Let's start here. Eric Ryan, one of Method's co-founders asked this question: "Why do people hide their household products under the sink?" Apparently, he attempted to answer his own question and Method was born. Method creates cleaning products that not only look good displayed in your home—the ultra attractive packaging makes them difficult to ignore on the retail shelf. Just ask my wife. And the hand wash in particular combines a great scent with a rich texture. Method could have just chosen to focus on what was inside the container, but instead they chose to give just as much attention to the shapes and materials holding their formulas. People against dirty. For Method, it's more than just a catchy tag line. Method products consist of non-toxic materials, and are not tested on animals. In addition to clean consciences, Method believes in "home-love"—walking in the door after a long day or "vexing set of errands and breathing the pure fresh vitality of the place that Dorothy wished for" (as in Dorothy from the Wizard of OZ.) In short, you could say that Method believes in clean body, mind and spirit. Far from just selling cleaning products. Let's start with the site. Like the products and brand—it's about clean. The visually attractive products get center stage treatment—it's effortless to browse through them and view different fragrances etc. Then, if you decide you want to purchase something on the spot—it's easy to do so. E-commerce and an attractive Website are not enough. 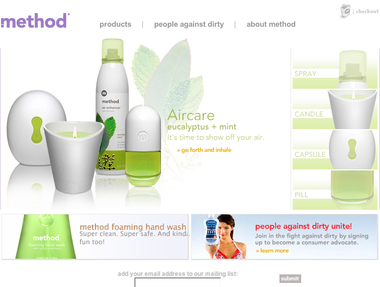 Last year Method launched a viral campaign at come clean.com. The campaign was wildly successful—spread across the Internet and won lots of awards. Why? Because it invited people to anonymously confess their secrets and "come clean" with a quick squirt of Method hand soap and a nice rinse. Using video, and simple but delightful interactivity—the experience draws you in by sampling other people's confessions. And how can anyone resist that?